This project aims to use a variety of approaches to establish the nature of Bronze and Iron Age cultures in Mongolia, a subject hitherto poorly investigated. My own role in the project is to use zooarchaeological and ethnographic techniques in the interpretation of human-animal relationships. This is of critical importance to our understanding of a vast region which has apparently only ever been occupied by nomadic herders and which, due to political issues, has remained largely unexplored by archaeologists until now. 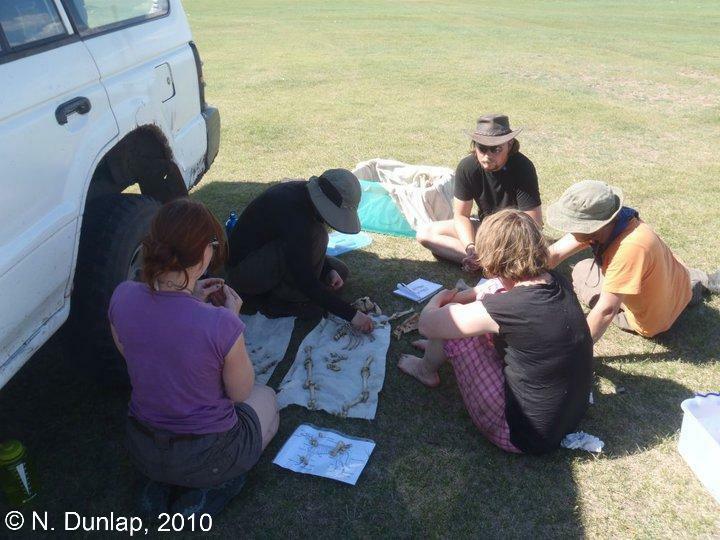 The project operates a field-school, in which I participate, offering zooarchaeology teaching to students and volunteers. Houle, J.-L., Broderick, L.G., 2011. Settlement Patterns and Domestic Economy of the Xiongnu in Khanuy Valley, Mongolia. In Brosseder, U., Miller, B.K., eds. Xiongnu Archaeology – Multidisciplinary Perspectives on the First Steppe Empire in Central Asia. (Bonn Contributions to Asian Archaeology 5). Vor-und Frühgeschichtliche Archäologie, Rheinische Friedrich-Wilhelms-Universität Bonn: Bonn. pp. 137-152. Broderick, L.G., Houle, J.-L., 2013. More than Just Horse: Dietary Breadth and Subsistence in Bronze Age Central Mongolia. Mongolian Journal of Anthropology, Archaeology and Ethnology 9, 1. Seitsonen, O., Houle, J.-L., Broderick, L.G., 2014. GIS Approaches to Past Mobility and Accessibility: An Example from the Bronze Age Khanuy Valley, Mongolia, in: Leary, J. (Ed. ), Past Mobilities: Archaeological Approaches to Movement and Mobility. Ashgate, Farnham, Surrey, pp. 79–112. Broderick, L.G., 2010. Khanuy say “Xiongnu Pastoralist Habitation Site?”, 31st AEA Annual Conference at the International Research Center for Japanese Studies, Kyoto. Broderick, L.G., 2011. No Deer: What can the matter be?, Deer and People: Past, Present and Future at the University of Lincoln. Broderick, L.G., 2011. Carcass Disposal and Inter-Site Variability, Professional Zooarchaeology Group Workshop on Taphonomy at the University of York. Seitsonen, O., Broderick, L.G. & Houle, J.-L., 2011. The Ritual Round, Theoretical Archaeology Group (TAG) 33rd Annual Meeting at the University of Birmingham. Broderick, L.G., Seitsonen, O. & Houle, J.-L., 2012. A Smell of Burning Fills the Startled Air – The Animal is no Longer There!, European Association of Archaeologists (EAA) 18th Annual Meeting at the University of Helsinki. Broderick, L.G., Seitsonen, O. & Houle, J.-L., 2014. The Culture Changes but the Herd Stays the Same: Bronze Age and Xiongnu Subsistence, Sixth Worldwide Conference of the Society for East Asian Archaeology (SEAA) at the National University of Mongolia, 2014. Broderick, L.G., Houle, J.-L. & Seitsonen, O., 2014. Archaeology, Society and Environment: A Collage from Mongolia, 35th AEA Annual Conference at Plymouth University, 2014.